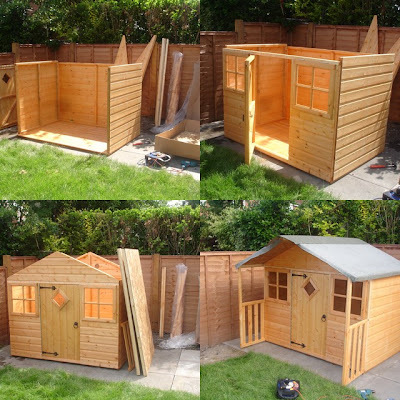 We bought a wooden Wendy House for ThingOne and ThingTwo (though it'll be a while before ThingTwo usues it). It arrived in pieces. I'd hoped to put it together in an evening, since Anne was stuck at home with a chicken poxed ThingOne, but alas there was much to do and it took me until the weekend. I'm used to Ikea spoon-feeding me, and making it hard to put things in the wrong slot. This wasn't a very easy task. And to be honest the product was a bit shoddy. Coupled with my second-rate DIY skills, it made for slow work. Once it was made we also got a toy kitchen from the Early Learning Centre. ThingOne was very impressed. 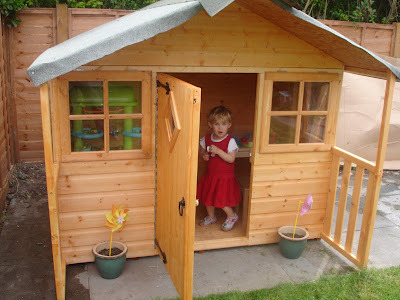 I spent an hour in there on Sunday with her as she made me cups of tea and snacks (pretend ones) and bossed me around. After some time her careful play degenerated into her throwing things onto the floor and finding it hilarious. I tried to regulate the play but quickly realised it was a pointless exercise. "Now now ThingOne, instead of throwing the pan on the floor, why not cook me some chips in it? Oh, can you pick those plates up from the floor please? No, don't throw the cutlery about! Leave that there. I know, why don't we throw EVERYTHING on the floor!"